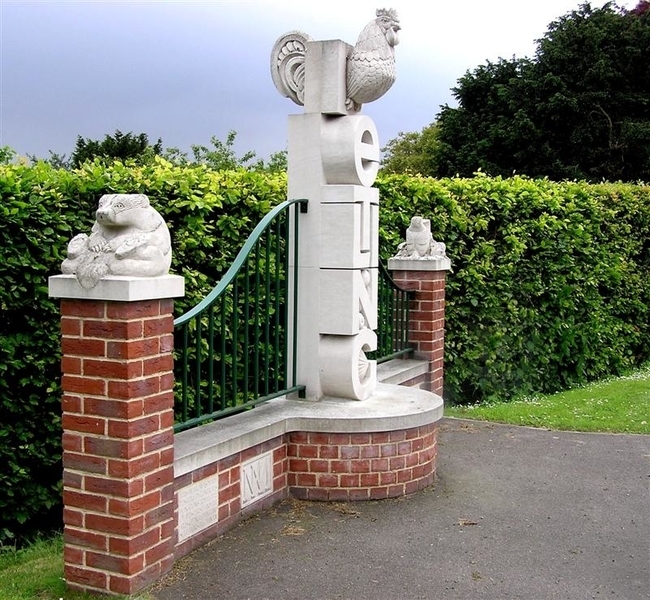 This is the most expensive village sign in the country, which shows the village name in sculpted Portland stone, flanked by a curved brick and stone wall and pillars with carved stone animals on top. The sign was unveiled in 2001, the project having apparently taken four years to finalise and cost over £20,000. Detling is a civil parish in the Borough of Maidstone. The parish is located on the slope of the North Downs, north east of Maidstone and on the Pilgrims' Way. Detling comes from the Old English ‘ingas’ meaning the ‘people of, people called after’ combined with a personal name; therefore, the ‘people of Dyttel’. Detling parish church is a Grade: I listed building, dedicated to Saint Martin of Tours. The Normans built the nave and chancel in the 12th century as a Chapel-of-Ease to Maidstone church with additions and extensions in the 13th and 15th centuries. In 1538, the church acquired a 14th century, wooden, four sided, reading lectern, with a swivel base, from Boxley Abbey. In 1798, Edward Hasted described the Detling church as a ‘small building, with a low pointed steeple, and is situated at the south west end of the village’. In 1861, the Victorian architect R C Hussey carried out restoration work. At the top of Detling Hill, the Royal Navy established an Air Station during WWI, and a satellite airfield in WWII. After the war, both the Army and RAF used the facility. Kent County Council subsequently developed the area as a county showground. Limestone is a sedimentary rock, which means it was formed from small particles of rock or stone that have been compacted by pressure. Sedimentary rock is important because it often contains fossils and gives clues about what type of rock was on the Earth long ago. Just like a tree's rings tell a lot about its environment, layers found in sedimentary rock can tell about important changes in the environment. Limestone is formed in two ways. It can be formed with the help of living organisms and by evaporation.Ocean-dwelling organisms such as oysters, clams, mussels and coral use calcium carbonate (CaCO3) found in seawater to create their shells and bones. 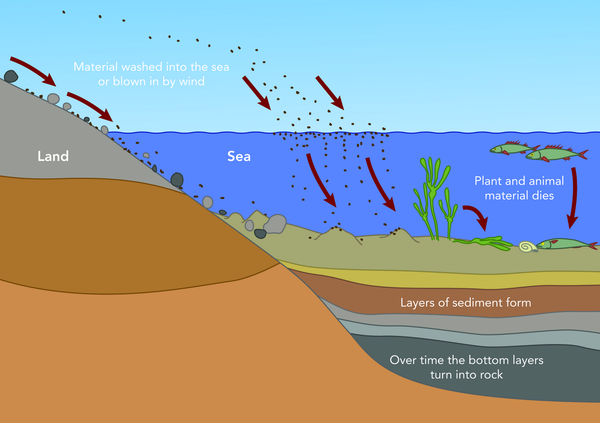 As these organisms die, their shells and bones are broken down by waves and settle on the ocean floor where they are compacted over millions of years, creating limestone from the sediments and the pressure of the ocean water. The second way limestone is formed is when water containing particles of calcium carbonate evaporate, leaving behind the sediment deposit. The water pressure compacts the sediment, creating limestone. Limestone is a sedimentary rock composed principally of calcium carbonate (calcite) or the double carbonate of calcium and magnesium (dolomite). It is commonly composed of tiny fossils, shell fragments and other fossilized debris. These fossils are frequently visible to the unaided eye on close examination of the stone surface, however this is not always the case. Some varieties of limestone have an extremely fine grain. 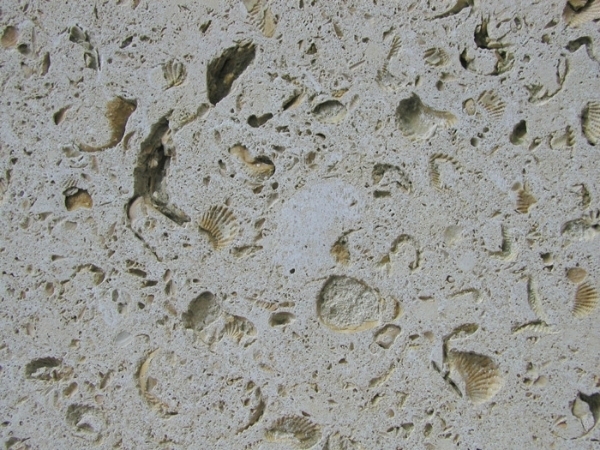 Limestone is usually grey, but it may also be white, yellow or brown. It is a soft rock and is easily scratched. It will effervesce readily in any common acid. Limestones may vary greatly in texture and porosity from coquina, which is a matrix of whole or pieces of sea shells loosely cemented by calcite, to oolitic limestones and microcrystalline limestones whose structures are so fine that they can be seen only under magnification. Limestone deposits can undergo metamorphism during major geological events resulting in a recrystallizing as marble. 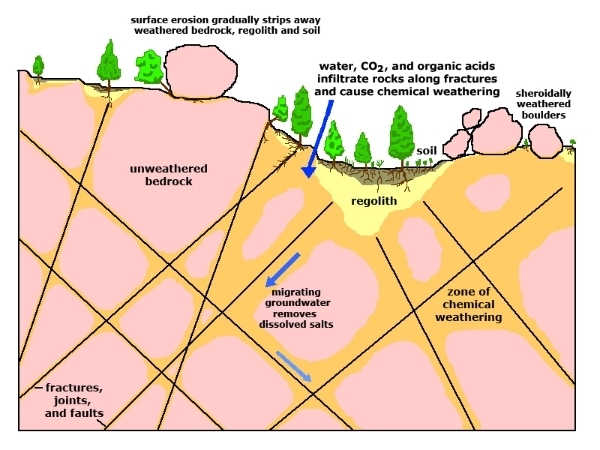 Chemical weathering is the weathering of rocks by chemicals is called chemical weathering. Rainwater is naturally slightly acidic because carbon dioxide from the air dissolves in it. Minerals in rocks may react with the rainwater, causing the rock to be weathered. Some types of rock are easily weathered by chemicals. For example, limestone and chalk are made of a mineral called calcium carbonate. When acidic rainwater falls on limestone or chalk, a chemical reaction happens. New soluble substances are formed in the reaction. These are washed away and the rock is weathered. Chemical weathering can hollow out caves and make cliffs fall away. When fossil fuels such as coal, oil and natural gas are burned, carbon dioxideand sulphur dioxide escape into the air. These dissolve in the water in the clouds and make the rainwater more acidic than normal. When this happens, we call the rain 'acid rain'. Acid rain makes chemical weathering happen more quickly. Buildings and statues made from rock are damaged as a result. (1) What are the colours and the texture of the Portland Limestone that forms the village sign? (2) Measure the Portland Limestone village sign, what is the height? (3) What geological period does Portland limestone come from and how many years ago? (4) Looking at the village sign why do you think Portland Limestone was chosen for this sculpture? (5) Look closely at the Portland Limestone forming the village sign, can you see any signs of weathering, what are these and what do you think would of caused them? (6) The village of Detling is located on the North Downs, what geological period does the North Downs come from? (7) Not compulsory but would it be nice if you can upload a photo of yourself or GPS at GZ.